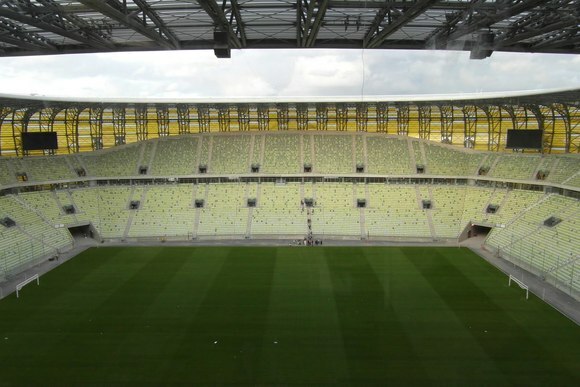 NORTHRIDGE, California — Polish audio integrator ESS Audio recently completed a major HARMAN installation at the new 44,000-seat PGE Arena in Gdánsk, Poland as the country prepares to co-host the UEFA Euro 2012 Championship. Replacing the previous Baltic Arena in the northern city, the PGE Arena Gdańsk takes its name from the Polish Energy Group. The stadium’s exterior is designed to resemble amber, which has long been extracted on the Baltic coast. ESS Audio provided the main public address system for the main bowl and stands as well as 40 VIP lounges, conference rooms and the stadium’s official pub. The main system features 75 JBL PD5212-64 WRX weather-resistant loudspeakers (to handle the extreme weather coming off the Baltic Sea), set in 24 clusters of three for the stand coverage, while the remaining three single speakers broadcast onto the field. The PA is powered by a total of 34 Crown CTs 3000 amplifiers equipped with PIP-USP3/CN cards to provide full network control. Signal processing is provided by a BSS Audio Soundweb London BLU-80 device, located in the audio control room and four BLU-32 devices set in each of the four amp rack positions. The design includes built-in redundancy, with a Crown CTs 3000 in each amp rack designated for emergency use (providing automatic changeover in the unlikely event of an amplifier failure). Each rack also includes a BSS Audio Soundweb London BLU-32 device. In the Skybox, the main control room houses a routing device for a Soundcraft GB 2/16 console and sends signals from four AKG 4500 channels of wireless microphones and three wired AKG microphones (a D5 and two C 535 EB II). Two JBL LSR2325P studio monitors provide near-field monitoring, along with AKG K 171 headphones. The processor rack also contains a BSS Audio Soundweb London BLU-80 device and two dbx AFS 224 Advanced Feedback Suppression Processors. The conference rooms feature JBL Control Series 29AV and Control 24CT loudspeakers, powered by Crown CDi series amps with processing handled by a dbx SC 32 Digital Matrix Processor and ZonePro 1260m Digital Zone Processors, along with eight channels of AKG 4500 wireless microphones. “Despite a limited budget, the sound is excellent because of the HARMAN equipment, and the results of independent measurements showed excellent speech intelligibility and SPL,” stated director of ESS Audio, Witold Karalow.